Cut out a large hole in the front of the milk bottle. Cut the handle off. Cut out large bunny ears out of the white foam and then two smaller bunny ears out of the pink foam to fit in the white ears. Hot glue the pink area into the white. Place some hot glue on the bottom edge of the front of each ear. Glue each ear to the back of the bottle. Bend the 3 white piper cleaners into a V shape and glue onto the milk bottle below the eyes. Glue two large white pompoms in the middle of the pipe cleaners and then a pink pompom on top of that. 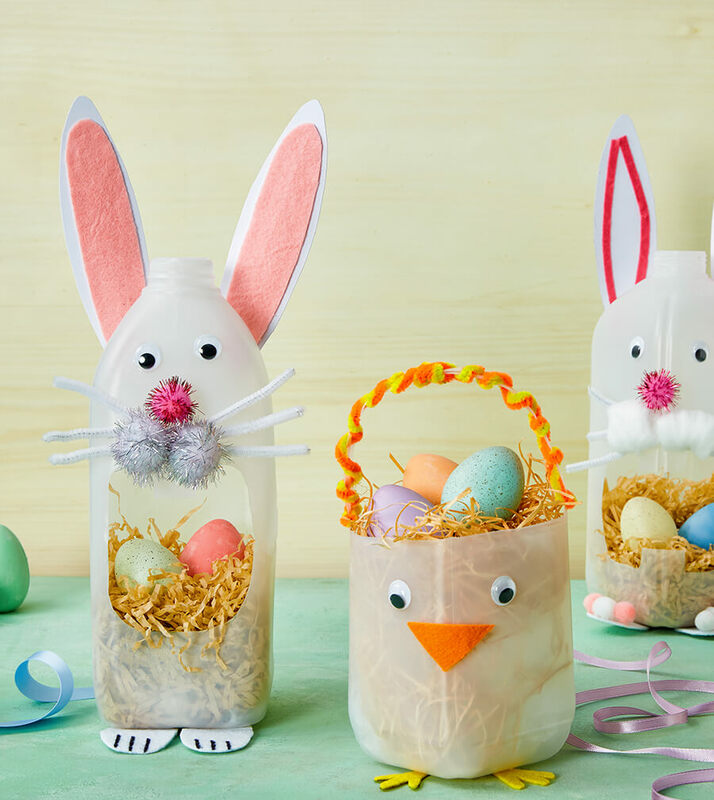 Glue a large white pompom on the back of the bottle to make the bunny’s tail. Cut the top half of the milk bottle off. Cut the handle off. Cut two feet out of the yellow foam. Cut a beak out of the orange foam. Glue the feet to the bottom of the bottle. Glue the beak to the front of the bottle. Glue two googly eyes above the beak. To make the basket handle, twist the orange and yellow pipe cleaners together and glue each end to the inside top of the bottle.